I am sooooo happy because September is my month. Heeheehee, yeah, I'm a September girl. I was born in this month 22 years ago. The happy factor is not only that, last month I joined Indonesian Beauty Blogger Make Up Challenge and I came out as a finalist, eventhough I didn't win, I am still happy to know that I was one of five finalist out of about 50 people who joined last month Make Up Challenge. It is new month and new Make Up Challenge has already started by Indonesian Beauty Blogger. 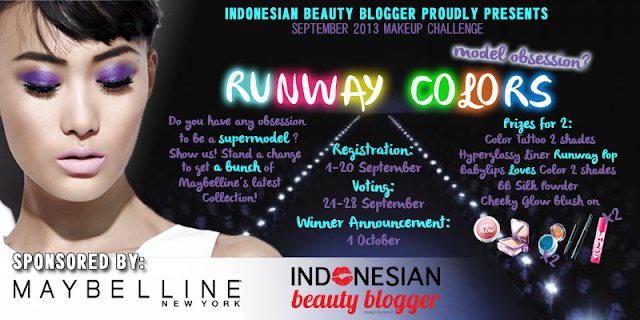 This month theme is 'Runway Colors' and sponsored by Maybelline New York. Of course i join the make up challenge again.. Most of runway make up were used natural looking and simple make up. Since the point of the Make Up Challenge for this month is color and I like unique look. 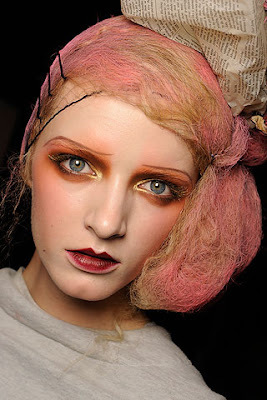 I chose John Galliano Spring 2010 Runway look as reference. Here is the look. And here is the look that I recreate on my face.. Since the facial feature between me and the model is different, the result also look different. For my eyebrow, I drew it with dark brown eyeshadow. I spend a lot time just to cover my eyebrows. I cover my lips with foundation and concealer before I drew and reshape my lips. Actually with those two lip products, I got almost similar lip color with the model but in camera it still looked red for me, so I made my lip look darker instead by dabbed a little bit brown eyeshadow. And i love the brow !! !